Being a graduate student and working in a bookstore is kind of like being a diabetic working in a candy shop: if I sampled as much of the stock as I wanted to, things would go very badly for me. Which is to say that I read a lot of academic books this year, and not nearly as many new titles from the store as I would have liked. Even when I was reading fiction, it wasn't always recent. The two books that probably marked me the most this year were Fernando's Pessoa's Book of Disquiet (published posthumously in 1982, long after the author's death in 1935) and Ursula Le Guin's The Dispossessed (published in 1974). One is a plotless, exquisitely described anatomy of a reclusive aesthete's melancholy fantasy life and the other is a masterpiece of utopian, feminist/anarchist sci-fi. I recommend them both very highly, even though they don't officially count towards my Top Ten list. Argentine writer César Aira is always a delight -- his novels (of which he has written nearly 80) are powered by madcap energy and little regard for the laws of physics or causality. Naturally, his method lends itself extremely well to the short story format, so it's remarkable that The Musical Brain is his first collection of short stories in English, spanning twenty years of work. I was continuously dazzled by this book -- any time his flights of surrealistic fantasy threaten to go off the rails, he gives wings to the train car and elevates the story to another level of virtuoso dexterity. An acrobatic performance! You don't need to be a grad student studying the relationship between contemporary art and information technology (ahem) to appreciate the extent to which the internet has revolutionized the way we experience visual culture. Cornell and Halter's hefty reader isn't the first publication to tackle the subject, but it is the thickest to date, reviving a publication series initiated between MIT Press and NYC's New Museum in 1984 -- the first volume of which was the now-canonical Art After Modernism, an anthology that defined postmodernism in the visual arts for a generation. Whether this tome will have a similar impact remains to be seen, but if you're interested in reading about the use of social networking platforms in art making, what increasing surveillance means for culture, and what "post-internet" art might be, you should give this book a look. From the authors of the controversial Accelerationist Manifesto comes a book-length treatise on the future of Left politics, if Leftists are willing to get futuristic. It's a bracing antidote to both the fatuousness of tech-friendly TED-talk culture and the wooly delusions of folk-political activism trapped in nostalgia and committed to ineffective and purely symbolic small-scale goals. I'm halfway through it right now and, while I think a number of points could be more persuasively argued, I am very much in agreement with their analysis and proposals. An important book. Jacob Wren is a treasure. This slim little book contains two stories and an essay on Wren's perennial themes of autofiction and how to reconcile art and politics, wrought with his characteristic commitment, sensitivity, and self-reflexivity. Wren is also a performance artist whose late-2014 project, Adventures can be found anywhere, même dans la mélancolie, prompted me to spend the darkest part of Winter 2015 reading Fernando Pessoa's hypnotically despondent Book of Disquiet (see above). Thanks, Jacob! 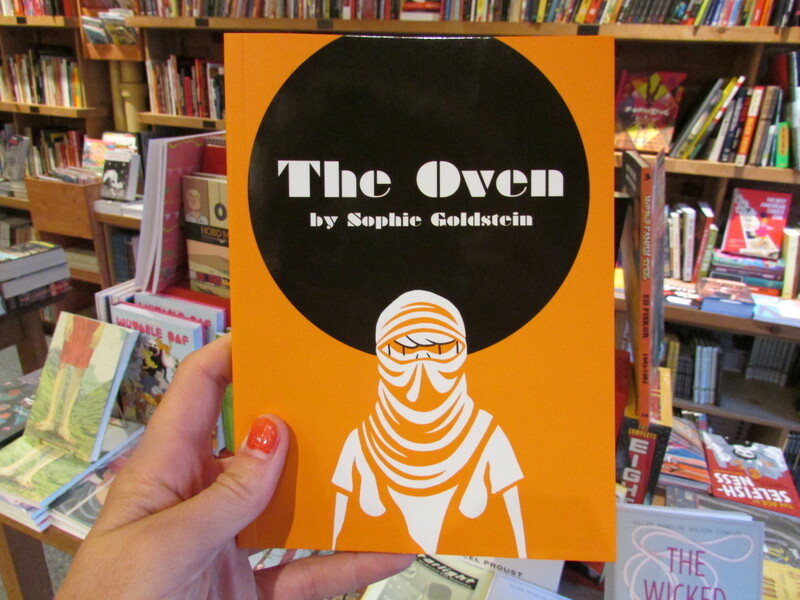 Sophie Goldstein was an intern at D&Q in 2013, and when she brought in her self-published comic House of Women, I was pretty blown away -- she was a comic artist to watch, I thought. Sure enough, with The Oven, her style has matured into total assurance. It's a thoughtful, stylish story about a post-apocalyptic commune where the protagonists flee to try and conceive a baby naturally, beyond the reach of the repressive future state. Things turn out to be not totally utopian. I can't wait to see what Sophie does next. It's been a big year for Spanish writer Enrique Vila-Matas. His latest novel, The Illogic of Kassel (based on his experience as a writer-in-residence at the most recent Documenta art event in Kassel, Germany) was published in English, and his cult classic, A Brief History of Portable Literature (first published in Spanish in 1985) was translated into English for the first time. Like Roberto Bolaño, with whom he was friends and to whom he is often compared, Vila-Matas' subject is literature itself and his erudite books delight in fictionalizing factual histories and treating invented ones in a documentary manner. Appropriately, Because She Never Asked, also newly-published by New Directions, recounts his non-encounter with Sophie Calle, an artist equally invested in blurring fact and fiction; he writes a story for her to enact, she eludes him. If you're a fan of Borges and you've not yet read Vila-Matas, follow the advice of Rilke's "Archaic Torso of Apollo": you must change your life. Speaking of life-changing events, I remember the first time I ever looked at J. Kenji Lopez-Alt's food blog: it was a post about how to make the perfect boiled egg, complete with a scientific explanation of exactly what happens inside an egg when you boil it and a series of photos detailing every possible result based on a variety of methods. As a control-freak in the kitchen, his fastidious approach appealed to me on a deep level. More importantly, it ensured that I have never since boiled a bad egg. I've also taken to consulting him on every possible technical matter, from how (and why) you should spatchcock a Christmas turkey to why baking soda is the key to perfect pancakes. When I saw that his wisdom was going to be available in hardcover format, it was a no-brainer: I put one on order instantly. It hasn't left my kitchen counter since. Kate Beaton is wonderful, so I knew before I saw it that I was going to get this book for my toddler, who is one and a half. As it turns out, though, she is obsessed with it. If I ask her where the fat pony is, she will go to her shelf, get the book, open the flaps, and jab her finger at the 25 tiled images of said pony that line the inside covers. When she's a little older, she may appreciate the story's message of self-assertiveness and inclusion. In the meantime, I'm pretty sure she gets the fart jokes. Almost everyone I talk about books with has read, is reading, or plans to read The Argonauts and Elena Ferrante's Neapolitan novels. I haven't got to them yet, partially out of sheer contrarianism, though I don't doubt that I will find them as compelling as my friends and colleagues have. Pushkin Press is extraordinary. Their taste in both selecting their titles and designing the jackets is absolutely impeccable. These are the three titles from them that most attracted my attention this year. Other fiction I want to read, all incidentally (or not?) by Latin American authors. I guess I have a thing. Check out the rest of the staff's Top Tens, too!